0000: Final briefing, the target of choice is Hiroshima. Lt. Col. Paul Tibbets is pilot, Robert Lewis is co-pilot. 0245: Enola Gay begins takeoff roll. 0730: The bomb is armed. 0850: Flying at 31,000 ft Enola Gay crosses Shikoku due east of Hiroshima. Bombing conditions are good, the aim point is easily visible, and no opposition is encountered. 0915:17 Little Boy is released at 31060 feet. 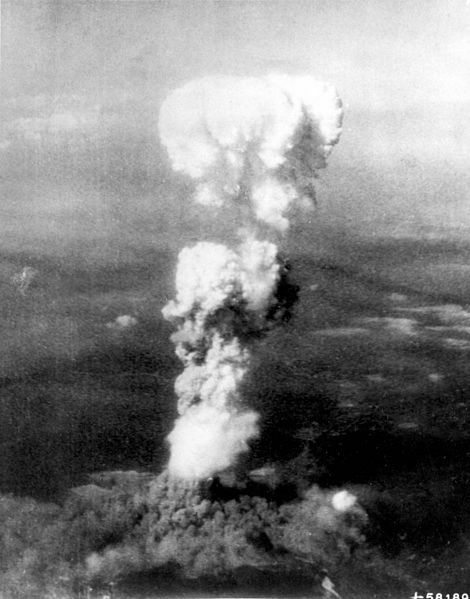 0916:02 (8:16:02 Hiroshima time) Little Boy explodes at an altitude of 1850 feet, 550 feet from the aim point, the Aioi Bridge, with a yield of 12.5-18 Kt (best estimate is 15 Kt).